The Centenary Centre has earned a well deserved reputation for providing countless shows of top-class entertainment since it first re-opened the doors of the old church hall built in 1877, but this year the venue will play host to a special two-day festival. Organised in association with the One World Centre and Manx Radio, this will be a unique opportunity to enjoy several bands bringing a rich, global rhythm to the Isle of Man. 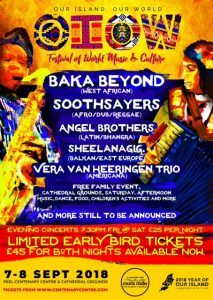 Held as part of the ongoing Year of Our Island initiative, the Centenary Centre will open its doors to the West African sound of Baka Beyond and the Latin/Bhangra of the Angel Brothers, both returning to the venue after a few years absence. They will be joined by the Soothsayers (Afro dub reggae), Sheelanagig (Balkan fun and grooves), The Vera van Heeringen Trio (Americana) and the Island’s very own Clash Vooar (Manx Gaelic/Jazz and folk roots grooves). Dancing at both events wholeheartedly encouraged! A free event has also been organised, noon – 5.00pm, within the grounds of Peel Cathedral on Saturday 8th September, with a plethora of events suitable for the whole family. This includes live music, dance displays on the newly completed Labyrinth, food samples from countries around the world and children’s activities; together with a free belly dance workshop and a free African singing workshop. If wet all outdoor events will be transferred into the cathedral. Meanwhile representatives of the various communities living on the Island will also be on hand to demonstrate aspects of their own home culture. Tickets for both concerts (7th and 8th September) are available now, priced at £25 each, from Celtic Gold, Peter Norris Music, Corlett’s Jewellers, ShaktiMan, Thompson Travel or direct from http://www.etickets.im/cc. Early bird combined tickets for both concerts priced at £45 also available online now.